The University of Kentucky’s Anthony Davis is one of college basketball’s most intriguing players this season. The 6-foot-10 Davis is still incredibly raw, due in large part to the fact that he was 6-foot-3 two years ago. As a result, Davis has played with exuberance rarely seen from more polished and less athletic big men. In college basketball, the words “raw” and “youthful” are usually thrown out there in a negative sense, but playing without the restrictions of knowing what you’re supposed to be doing does have its benefits. Then again, it also has its drawbacks. We pick up this possession as Kentucky is about to shoot. What should an athletic big man do in a situation like this? Get to the rim. Davis shows a great knack for doing that. Instead of running straight to the hoop, a route that would require him to go through a teammate and a defender, Davis loops around, finds a gap in the lane and slips into position right in front of the basket. 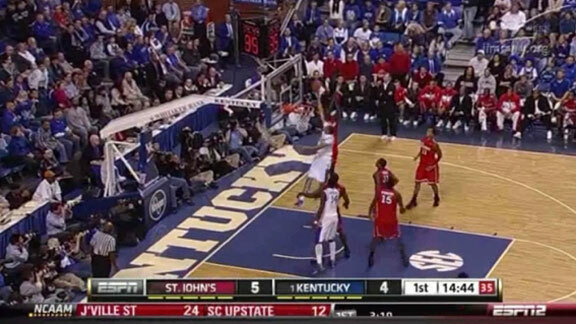 Now that Davis is at the rim, he can let his athletic ability take over. As the ball comes off of the rim, Davis reads it and gets to it, despite the fact that it bounces to the opposite side of the basket from Davis’ position. 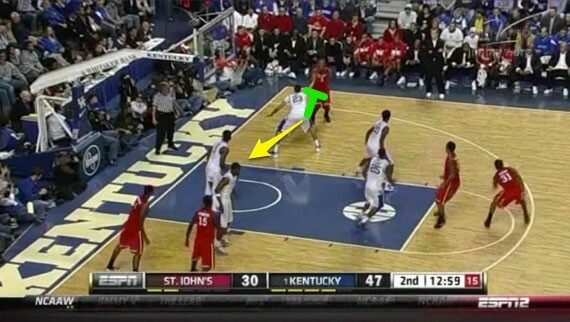 Once he’s in front of the rim, Davis’ length, quickness and range give him an excellent chance to collect any rebound. Additionally, Davis seems to know his role and doesn’t try to play too far outside of it. Here, as Kentucky works the ball around the perimeter, Davis is creeping, waiting for either a chance to cut off his defender for a dish and an easy dunk, or for a shot to go up so he can chase it off of the rim. When the ball is shot, Davis again chooses not to run straight to the rim. Instead, he loops around, goes behind the backboard, gets in front of his defender, and then positions himself in front of the basket. 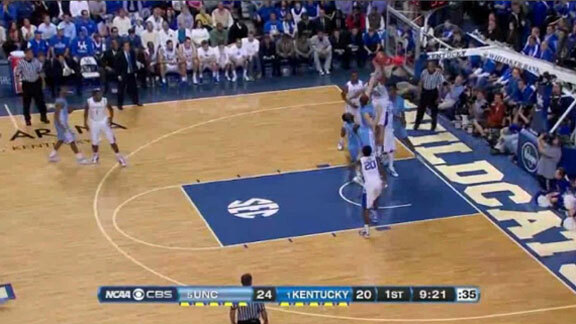 By looping around his man, Davis puts himself in perfect position to grab the basketball as it comes off of the rim. The combination of having the instincts to find a clean path to the rim and also possessing the quickness to beat your defender as he attempts to box you out is rare. Davis not only has it, but he knows how to use it. Watching these clips of Davis grabbing offensive rebounds (and goaltending once, but that play is too good to leave off), we see that Davis knows how to find the ball, pursue it, and then grab it. Davis’ athleticism and knack for getting to the rim are the same skills that — at this point in his development — prevent him from being a good defensive rebounder. Davis seems to approach defensive rebounding the same way he approaches offensive rebounding. That doesn’t work in college and it certainly won’t work in the NBA. 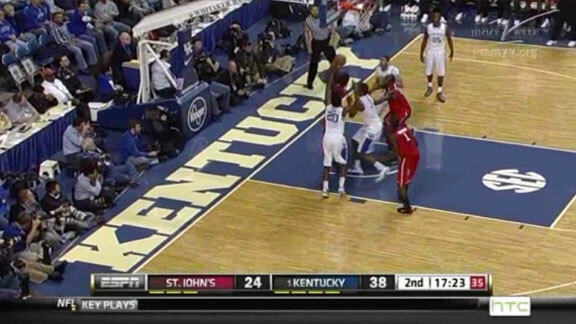 We pick up this possession as a St. John’s guard attempts a deep 3 early in the shot clock. 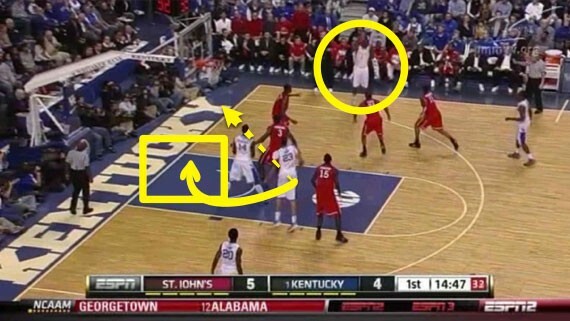 Davis and the player he’s defending are out of their comfort zone, near the 3-point line instead of in the paint. Despite this change in locale, the defensive rebounding strategy should be the same: Turn around, get your body into your man, cut him off, and then go for the ball. 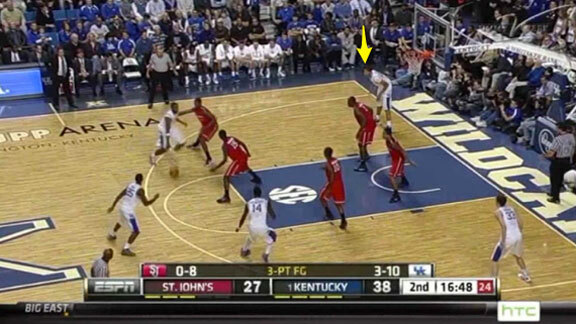 The key is staying between your man and the basket, and in this case, Davis already has the position advantage. However, instead of first making contact with his man, Davis runs straight to the rim, as if he were crashing the glass on offense. 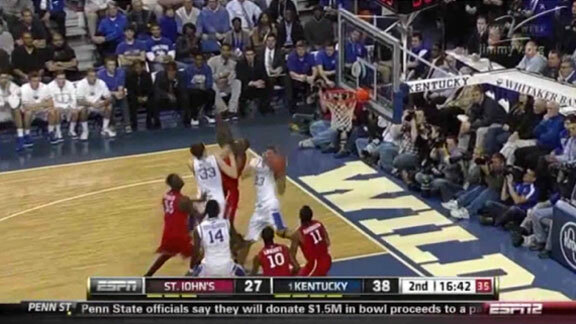 The problem is that Davis shouldn’t be crashing the boards. He should be trying to prevent his man from doing that. When he goes straight for the ball, he ends up knocking it away from his teammate, off the backboard, and right to his man, who got into the paint because nobody boxed him out. After bouncing around, the ball winds up in the hands of Davis’ man. If Davis had boxed him out and kept him out of the lane, he’d be a step close to the ball and it would have ended up in Davis’ hands. In the same game, Davis finds himself guarding a player with the ball who faces up against him and eventually settles for a jumper. When you defend a shooter, the rebounding fundamentals remain the same: Make contact with your man, keep him from crashing the boards, and then chase down the ball. Again, Davis pursues the ball as if it were an offensive rebounding opportunity by turning around and running to the hoop. Once again, the ball gets batted around, and because Davis runs straight to the rim and positions himself too deep, the ball bounces right over his head. Most of the time, rebounds don’t fall right into a player’s hands. Instead, they bounce around, and if you don’t box out you will usually end up out of position. Boxing out also requires trust. You won’t grab every rebound if you box out properly, but you need to believe that your teammates will also be boxing out. If they have all secured better rebounding position, then one of them should get the ball. Watching Davis chase after defensive rebounds, it looks as if he wants to grab every single defensive rebound. By acting on that impulse, he’s actually giving up offensive rebounds and extra possessions to the opposing team. 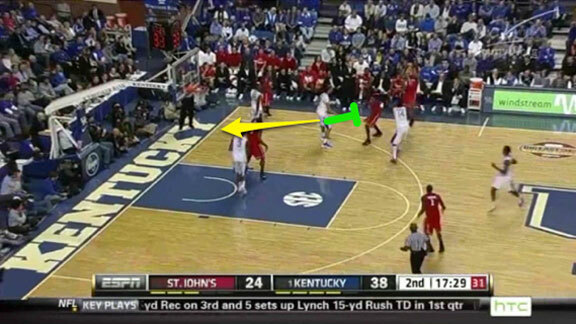 Zeller and Davis occupy the weakside block while the ball is in the opposite post. When the shot goes up, Davis does exactly what he is supposed to do. 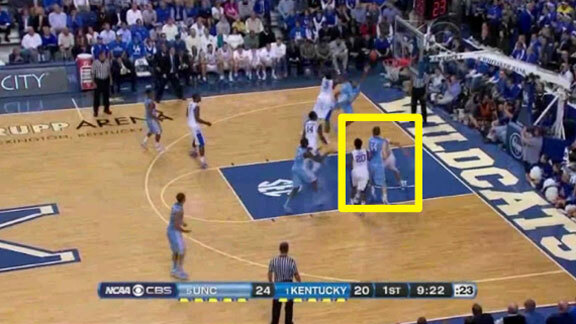 He turns and pushes his backside into Zeller. As the shot nears the basket, Davis is still doing the correct thing. 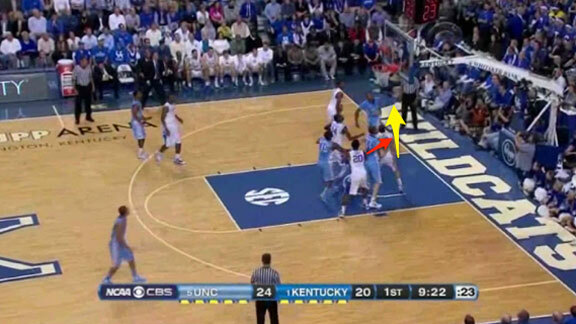 He’s low, he’s in Zeller’s body, and he seems determined to keep Zeller from getting to the rim. But Davis isn’t experienced at boxing out and his form could be better. As the ball gets closer to the rim, Davis stands up and leaves his stance. Now, Davis is already one of the skinniest elite big men in college basketball. To hold a more physically mature player like Zeller back, Davis’ form needs to be fantastic. He needs to keep a low base to keep Zeller from bullying him under the rim. 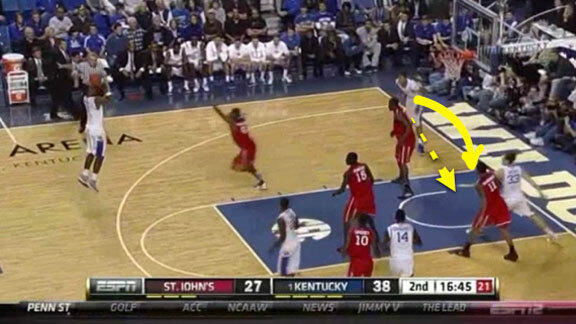 Once Davis gives up his stance, it allows Zeller to push him deep under the rim. So as the shot comes off the rim, Davis has to jump from directly under the basket. The only time you will get your hands on the ball from this position is when it goes through the net. 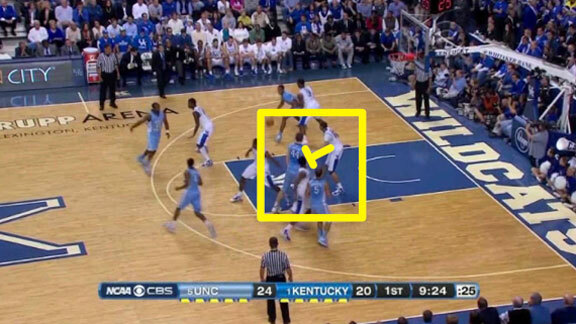 After pushing Davis all the way beneath the backboard, Zeller gets his hands on the ball and taps it in for two. While Davis still struggles with defensive rebounding, I expect to see him improve as the season continues. Davis has already shown that he is willing to box out, rather than just trying to out-jump his opponents. Once he improves his form and gains more experience, this hole in the talented young big man’s game should be sealed.